There’s no need to head inside just because cooler temperatures are on the way. There’s still plenty of time to enjoy outdoor living. The weather is stellar and the scenery, magnificent. Don’t miss out! So what makes the best outdoor spaces this fall? With just a few simple features you can totally enjoy an already awesome season, outside. Best of all, these ideas don’t have to break-the-bank. With shorter days, lighting extends the use of an outdoor space once the sun goes down. For a few hundred dollars, built-in lighting systems can be incorporated into a deck, screened porch, gazebo or even a pergola. 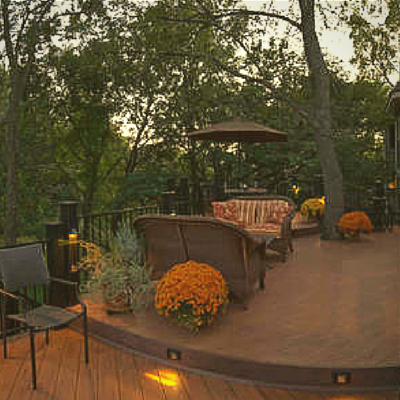 Typically lighting for decks is accomplished with step riser, rail and post lights; post cap, solar and rope lighting. If you’d really like to splurge, explore professional systems that illuminate your entire property with companies like Outdoor Lighting Perspectives. On the other end of the spectrum, if you’d prefer to keep cost way down, create a festive glow for an evenings outside with decorative lanterns, solar tiki torches and flameless candles too. One particular image on Pinterest, ‘Tiki Torch Bouquet’, is quite popular. It’s clever, fun and easy to make! Check it out here. Warmth for your time spent outdoors can be accomplished in all sorts of ways, at any price point. For starters, just open up your closet and grab a hoodie, sweater or plaid blanket! 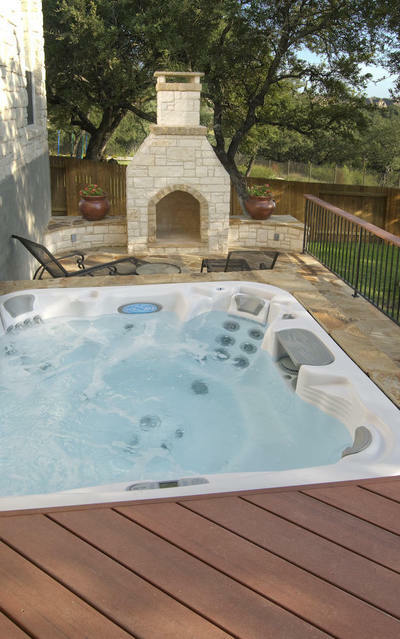 But if you’re looking to really heat-up an outdoor space, there’s a ‘closet-full” of options too: space heaters, fire features, hot tubs and outdoor fireplaces. For a few dollars, or a few thousand dollars, you can certainly take the chill out of the air. Electric or gas heaters are functional and attractive. From big box retailers to specialty shops, pedestal or wall mounted heaters for outdoor spaces are readily available. An actual fire feature can be as simple as a table-top ornament, a wood-burning chiminea, a portable fire pit table (wood, electric infrared, gas, fire glass), custom built-in fire pits, DIY modular fireplace kits or prefabricated models. A fully customized outdoor fireplace can get a little pricey but boy-oh-boy they’re magnificent. With all of the options out there, check with your contractor for suggestions. As a sidebar, your local safety ordinances will determine what is (or isn’t) permitted when it comes to outdoor fires. And it’s always wise to check with your insurance company too. If you have a green light for an outdoor fire feature, think about the total size; cost, installation and maintenance; portable unit verses a permanent structure. Fall decorations can be quite elaborate or quite simple too. And there’s inventive ways to accomplish either! If you’re interested in the less expensive options, you can still think beyond orange pumpkins and a bale of hay. Among decorators, colored pumpkins are all the rage especially those natural beauties found in shades of gray, blue, ivory and red. If you can’t purchase these types at your local farmer’s market, Design Master ColorTool Paint should work well too. Flowering plants are a perfect complement to an outdoor space. Mums are always popular for autumn. But if you’re an ambitious gardener, switch-out or create large containers for a full-blown fall arrangement. Another effective way to decorate a deck or screened porch for fall is by switching up the outdoor rugs, cushions or throw pillows. The strategy is simple: let nature be your guide and add those colors you see in the changing leaves. We have a board on Pinterest for Fall Outdoor Space – 2014. Take a peek. 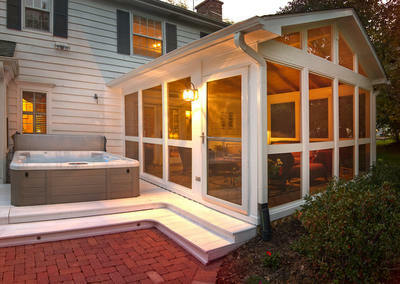 As the air turns crisp, enjoy life outdoors and create your very own cozy backyard retreat that fits with your budget. A perfect autumn outdoor space is colorful but calm and classic. 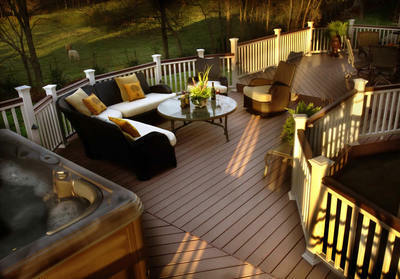 You can reinvent an existing deck or screened porch with a scattering of accessories and simple decorations. It doesn’t take much to transition from a summertime-space to a fall-space. 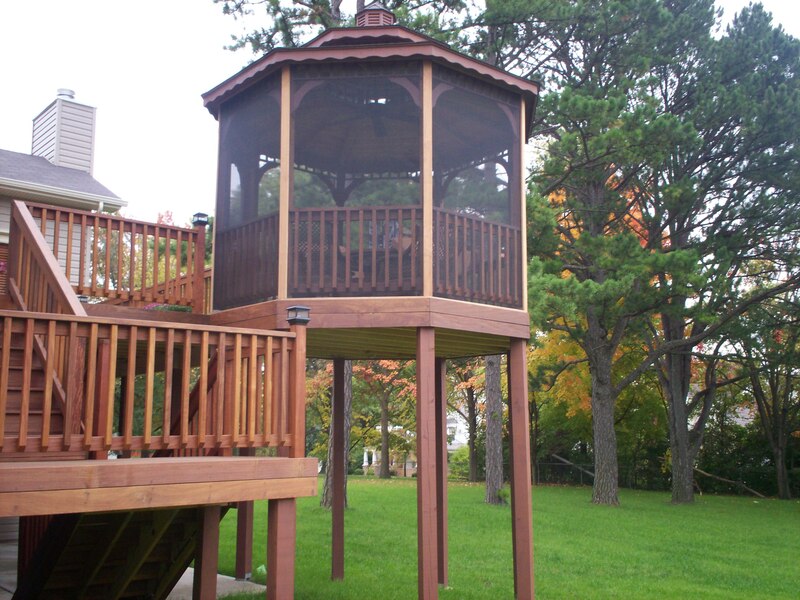 If you don’t already have an outdoor space or you’re ready to remodel or replace the one that you have, please consider Archadeck. Here in St. Louis, Missouri we serve the entire region including St. Charles, St. Charles County and parts of Illinois. To learn more about us, visit our website, west-county.archadeck.com and visit the About Us page. And of course, you can just give us a call anytime 636.227.0800. If you’d like to do a little more exploring, follow us on Pinterest for tips from our blog and other valuable resources, ideas and inspiration for outdoor living. Thank you so much for considering Archadeck!